Standard drainage track 3/16” above floor. Optional raised threshold for extreme weather resistance. Low profile thresholds for ADA compliance. Aluminium is the ideal material for multi-leaf Sliding and Lift & Slide door systems. The solidity of our thermally broken profiles coupled with good machinability, guarantees precision-fit components. Expect a high degree of energy-saving weathertightness, as well as optimum sound insulation. TRU systems can be combined with curved or specialty segments to create stunning architectural effects and to open up panoramic views with virtually no sight line interference. 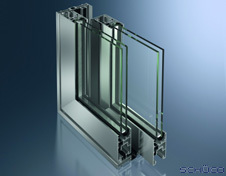 Constructions include Sliding Doors, and Sliding doors with LIft & Slide Technology. While the TRU Lift & Slide Mechanism moves glass panels weighing up to 850 pounds with the touch of a hand, all Sliding constructions are impressively smooth & easy to handle. An almost unlimited range of different surface finishes available. The new series of universal handles completes our range of technologically advanced products for all aspects of opening units. The uniform design range is extremely easy to operate and has an impressively clear language of form. With minimal escutcheons our handles are modern luxury, and suitable for all mechanical Sliding and Folding Doors. Lift & Slide Door Hardware is engineered specifically for our doors and has been designed for ease of use. The combination of design and technology even accommodates the special requirements for fire protection.